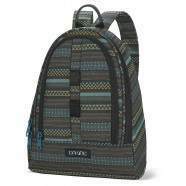 Perfect for carrying your everyday essentials this is a fantastic backpack for work and play. :: Women > Backpacks. Dimensions: W: 30cm (12 inches). H: 42cm (16.5 inches). D: 15cm (6 inches)Lightly-padded shoulder strapsAnimal backpackInternal zip pocketZip-across pocket at the topSpacious main compartmentMaterial: 100% PolyesterCapacity: 20 litresA4-compatible Size: one size.